Ever wondered how your webpage downloads to your computer screen at the touch of a button? The brain behind it is that little box called a modem which projects data wirelessly from one place to the next using the data from a telephone line. They have come a long way over the years with the first ones taking over 15 hours to load an average sized webpage. Now, pages download within seconds and information can be transferred from one device to another almost instantaneously. 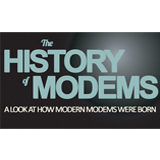 This infographic shows precisely how far the modem has come in the last fifty years. This informative infographic was produced by our friends at broadbandchoices.co.uk – offering the best UK deals on cheap broadband. Be sure to check out their speed test! I am using a modem but I did not know there is a such a big history behind this and I am sure it will be advance in the future. Mushfique – same here i used to get shouted at all the time for blocking up the phone, in the end i had to do all my downloading at night. Ah the good old days of the dial up modem, i miss the sound of the of the computers handshaking when trying to connect, but i certainly don't miss the the speeds. I can remember when you would click on a link then go make a cup of tea and then hopefully by the time you came back the page would have finished loading. Great goods from you, man. I have understand your stuff previous to and you're just extremely excellent. I really like what you've acquired here, really like what you are saying and the way in which you say it. You make it entertaining and you still care for to keep it sensible. I cant wait to read far more from you. This is actually a tremendous website. Amazing it is!. I agree, now, pages download within seconds and information can be transferred from one device to another almost instantaneously. See how far this modem come in the last fifthy years. I think it is an expensive technology for me. Thanks. whether you think the current best modem? Boy, haven't we come a long way… And the speed and functionality improvements seem to be accelerating. I get the feeling that we are still underestimating the power and potential of future modems…Anyone else think so? Within a few years, such a massive acceleration of development in modem is really outstanding. Agree with you Carly. I remember asking permission from my Dad to browse the internet for half an hour about 7 years back because I had to keep the phone line busy. What a change! I believe more improvements are on the way !